Can you read the computer's mind? Use logic to guess the random number the computer is thinking of and you become a Mind Reader. The computer will give you clues, but if you don't use logic, some of the clues might throw you off the track! Mind Reader is a one-player game, you against the computer. The object is to guess the number the computer is thinking of. The number can be 2 to 5 digits long. You have 20 guesses or a time limit. Catch the computer in a binary bind, and you win every time! 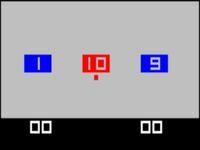 Nim is the oldest two-person mathematical game known to man. Nim is believed to be Chinese in origin. The basis of the game is simple. There are several piles of objects. Each pile contains from 1 to 15 objects. Each player takes turn taking any number of objects out of any pile. You have to take at least one object, and you can take objects out of only one pile. The player who takes the last object off the table wins. In the 21st century version of Nim, you play against the computer. You have a choice of 3, 6, or 9 piles. The objects in the piles are numbers, 1 to 15. The player who takes the last number off the screen wins.